My perception of time right now is off. It was only two weeks ago, on July 12, that this lunar cycle began. It feels much longer. I know this is my perception. Yours may be different. Some astrological influences can really mess with time, especially if they are impacting personal points in our charts. Eclipses are definitely one of those influences. And, yes, this one is personal to me. The July 12 new moon, was a solar eclipse, seeded in the sign of Cancer, the sign of home. I set an intention for this cycle to honor and strengthen home as a source of resiliency. The eclipse fell on my Jupiter in Cancer and the ruler of my Sagittarius ascendant. Home is a big deal to me. This lunar cycle has opened up all the ways I am and am not home in myself. Openings have been made. Time has expanded. Solar eclipses, always occurring at new Moons, are potent opportunities to shed the old to make way for the new. If new Moons are good times to begin magical intention, eclipses take that magic to the next level. 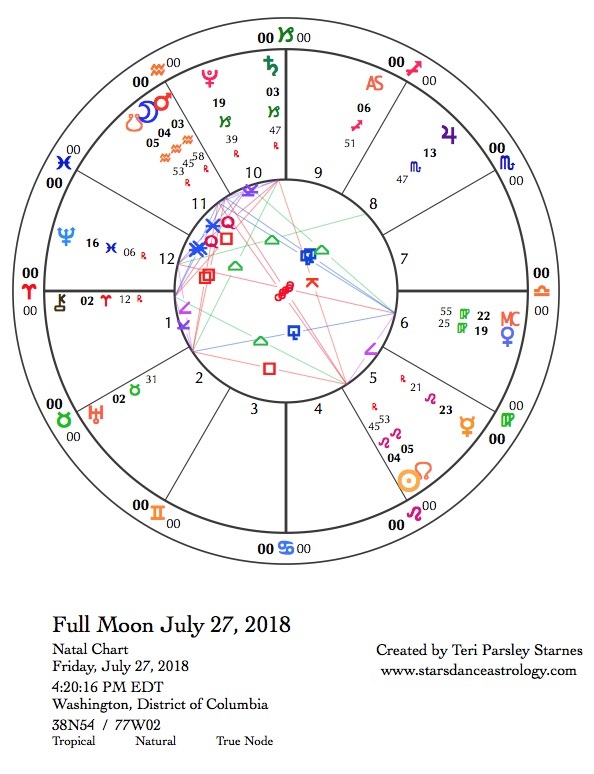 This lunar cycle is a doozy for that, even if it doesn’t fall on a personal point in your chart. Co-existing transits make this a significant lunar cycle. What is opening in you? The planets are mirroring the changes we are experiencing. A lot is in flux. We may feel we’ve reached a crisis point. With eclipses, some things are illuminated and others fall into darkness. Right before the full Moon, Mercury in Leo stationed retrograde. The Sun in Leo perfected two aspects: a stressful square to Uranus in Taurus and an unbalancing opposition to Mars in Aquarius. A few days later, on August 1, Mars will square Uranus, a connection that is often described as explosive. This full Moon captures these influences and magnifies them. This 5th act of the lunar cycle is revelatory and cathartic. Perhaps, we don’t want this much tension surrounding an intention based in Cancer’s sensitivity. It would be quite forgivable, and maybe even smart, to retreat for a few days until these influences play out. Perhaps that is what home offers us at times, a shelter in the storm. What shelters you? The topic of home always brings up issues of privilege, injustice, and compassion for me. I am privileged to have a shelter from some storms. Right now, people seeking shelter are not only being turned away from U.S. borders, but are experiencing violence as children are separated from their caregivers. Can I/we extend our compassion in these hard times to those who have much less security and much less justice than we do? We can let these powerful transits galvanize our compassion and our actions for justice. Home can be the shelter that also revitalizes us to re-enter our battles with empathy for others and compassion for ourselves. Although the new Moon occurred in Cancer, influencing the arena of life where we sow our seeds, the revelations of this full Moon come from the opposing signs, Aquarius and Leo. Both Aquarius and Leo have a way of making things bigger. The part of us that wants to self-nurture and protect (Cancer) might be a little overwhelmed by how big these influences are at this moment. The rulers of Leo (the Sun) and Aquarius (Uranus) are square each other at the full Moon. We are feeling internal and external battles around personal authenticity and collective visions. We know we cannot act as solitary heroes but struggle to align with our communities to enact change. Questions like, Do I fit in here? Can we lean into each other even when it is hard? How can we recognize our interdependencies? How do we move at the speed of trust? are swirling around us. A powerful, helping transit exact at the full Moon is worth noting and invoking. Venus in Virgo makes a trine aspect to Pluto in Capricorn. Venus represents love and beauty. Pluto represents transformation. Both are in earth signs. How is Earth the teacher right now? This isn’t light and airy love, beauty, and transformation. This is the shadow-filled, no time for illusions version of love, beauty, and transformation. This is pragmatic magic. What gets it done? What are we willing to let go of? Remembering that an eclipse is an opportunity to let go of old patterns to create new ones, what magic will you do at this full Moon? What dreams will you dare to release into this opening? Perhaps we have another go at difficult conversations today. It hasn’t been easy lately to connect satisfactorily with others, but the Moon in air sign Aquarius stimulates ideas and the sharing of ideas. However, we’ll have to be patient, because recent impediments to clear communication are still with us. Mercury is retrograde in Leo and Mars is retrograde in Aquarius. Things can go sideways easily. These retrogrades provide an opportunity to have second thoughts. Righteous fervor might be a questionable attitude right now. We are meant to develop nuance and complexity. What do your second thoughts want you to know? A square between the Moon and Jupiter in Scorpio could spark hurt feelings. The opportunity to reframe and reset the ways we react is a part of the day. Non-attachment may help. The Moon is void of course (VOC) for a great part of this day (from 4:25 am to 6:28 pm CDT). 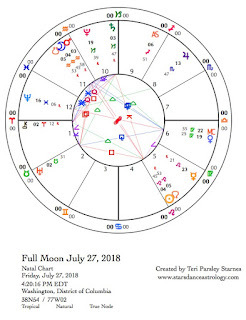 I am not a big proponent of do nothing during VOC Moons, but we may notice a deflation, like the wind just got released out of us, while we prepare for the Moon’s entrance into Pisces. This pause may be just what we need to switch gears from mental activity to emotional integration. You may notice you have a lot of emotion to integrate. Be gentle with yourself. What you are experiencing is the natural pulsation between expansion and contraction. Think of it as breath.